The City that never sleeps.. home to some of the most fashion conscious and groomed in the world, New York is my ultimate favourite place to go. A city where you can truly experience every season as it should be, the summers are hot, winters are snowy and you definitely have to have the appropriate wardobe! I love the buzzing atmosphere, pounding the pavements and enjoying watching the world go by in typical Mahattan fashion. My summer look for 'The City' would be a capsule wardrobe of chic pieces with some fierce shoes and accessories to up the glam factor. You can't beat a pair of skinny jeans or tailored shorts, white shirt, blazer and ballet pumps combo to feel smart but also keep comfortable whilst taking in the sights. To take the outfit from being too boring to feeling a million dollars I would throw in some colour and stud detail! 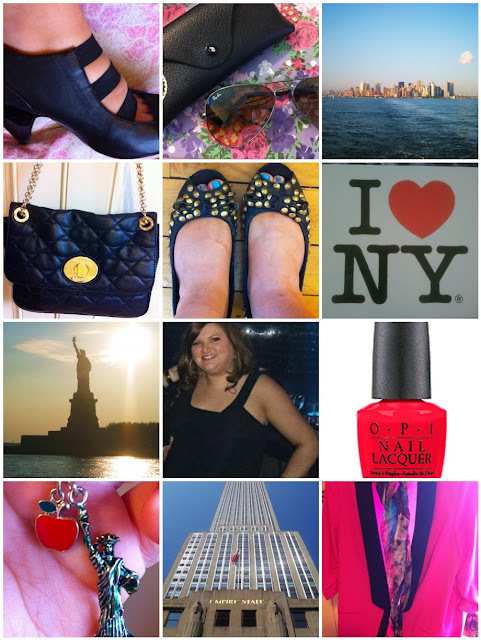 In New York, unpolished nails are a no-no so I would have to give myself a manicure with a coat of OPI's Big Apple Red and for evening you can't go wrong with an LBD and killer heels.. The shopping in New York is amazing and you don't even need to spend a fortune.. Century 21 is like an uber version of TK Maxx except you should expect to find D&G and Pucci pieces at a fraction of their RRP. Bloomingdales is the Department Store of choice for me.. selling a great range of brands and lovely surroundings mean that I am happy to shop there whereas some of the other more snooty department stores don't exactly make you want to part with your hard earned cash. If I have one recommendation for a short break to New York it is try and experience as much as you can.. I went for 3 days and felt like I practically ran round the city but I honestly got to see a lot. The bus tours are a great way of getting in all of the main sights and you normally get a river cruise and entrance to Empire State thrown in. Also get yourself down to Broadway and see a show, I am a HUGE Disney fan and was filling up when we watched the Lion King, those performers are so incredibly talented!